Click the button below to add the The Beatles Yellow Submarine Watch in Wooden Guitar Display Case Gold to your wish list. 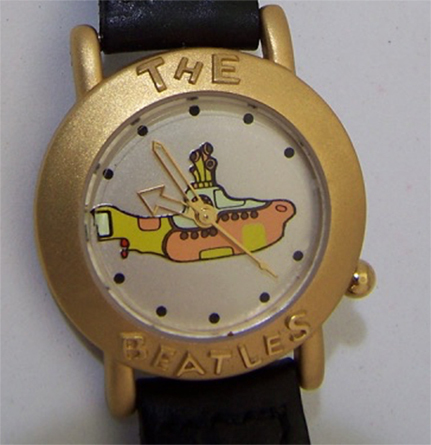 The Beatles Yellow Submarine Gold tone collectors wristwatch in wooden guitar shaped display case, New, never worn working Limited Edition wristwatch. 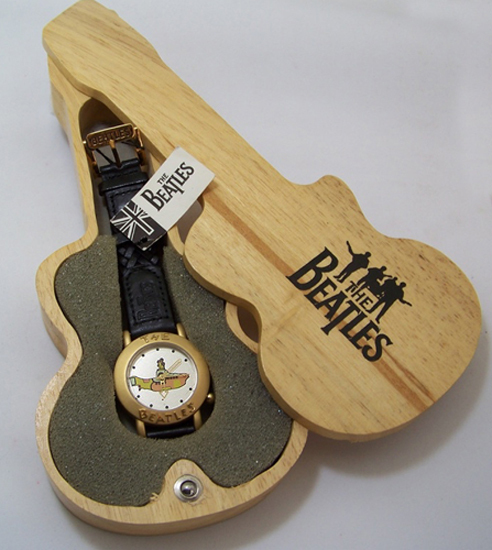 The Beatles Apple Corp watch comes in slide apart wooden guitar shaped display and storage case. 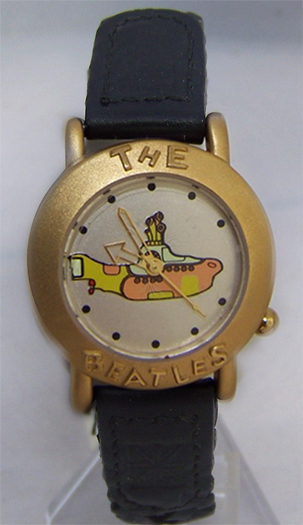 The Beatles name logo in raised gold tone on the Bezel and Yellow Sub logo on watch face. Comes on a black braided leather band with Beatles logo on band and clasp. Vintage mid 1993 Apple Corp. manufactured sold out collectible. New, never worn working condition. Case Diameter 34 mm, Band width 16 mm, Stainless steel case, Water resistant, Original Apple Corp Ltd. watch band. Designed and sized as a mens watch: also now also popular as an oversized wristwatch for women. We have another of these listed elsewhere in a silver tone version!